As the British mission in Iraq moves towards a close, one soldier recalls the day his unit was forced to fix bayonets and engage in close-quarter combat with insurgents. "Basically, it was short, sharp and furious. Al Amara was the place to be if you were an infantry soldier." So says Sgt Brian Wood, of A Company, 1st Battalion the Princess of Wales' Royal Regiment, remembering the battle that won him the Military Cross. It was the first time since the Falklands War that British soldiers had fixed bayonets before going into combat, in what became known as the "Battle of Danny Boy," named after the vehicle checkpoint nearby, some 15 miles south of the city of Al Amara. Today, Sgt Wood is at a rather different vehicle checkpoint near the gates of the main Basra military camp, helping train the American contractors who will take it over. The peaceful scene on this sunny spring day could not be more different from the images in his mind of his tour of duty in 2004 on Operation Telic 4. Back then, he says: "We were constantly under attack. If mortars weren't coming into our base, then we were dragged out into the city to help other units under fire." Every detail of 14 May 2004 is still etched on his mind. "We were conducting a vehicle checkpoint, but we were told to mount up sharpish. "We heard that there'd been an incident with the Argyll and Sutherland Highlanders, and someone had been hit by a grenade and another had been shot in the arm. Our role was to extract them." But on the way there in its armoured Warrior vehicles, his unit was ambushed by insurgents from the Jaish al-Mahdi or Mahdi Army - supporters of the cleric Moqtada al-Sadr - from three positions. Then came the order to dismount and fix bayonets onto their SA80 rifles, not something Sgt Wood, then a lance corporal, had ever expected to hear in his lifetime. "The adrenalin going through my body was like nothing I'd ever felt before. I just led my boys in and hoped for the best. "We've got a lot of firepower with the Warrior, so I'd never dreamt we would be told to dismount and engage in close-quarter battles. "It hadn't happened since the Falklands War and fighting in the trench with the enemy down at your feet was an experience I'll never forget." They had to charge across open ground and in the trenches they fought for five hours in one of the most intense battles since the Falklands. As Sgt Wood and his men fought against a well-armed adversary, he expected at any minute to hear the cry "Man down!" He still does not know how they managed to emerge without serious casualties that day. What happened in the aftermath of the battle is currently the subject of dispute in the High Court in London. 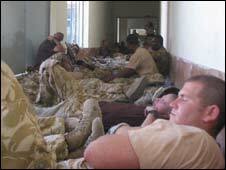 Lawyers for six Iraqis say some British troops might have used interrogation techniques on Iraqi detainees that breached human rights laws. They are asking the court to order an independent public inquiry into the Iraqis' allegations that British soldiers might have killed some captives held after the Battle of Danny Boy, amid claims they were tortured, murdered and their bodies mutilated. They are claims the Ministry of Defence vehemently rejects. The Defence Secretary John Hutton is opposing the application for judicial review, while MoD lawyers say that the 20 who died were undoubtedly killed during the fighting. They also argue that an independent and effective investigation has already been held by the Royal Military Police, showing that the bodies were taken back to camp so the insurgent ring-leaders - believed to be responsible for earlier attacks on British forces - could be identified. 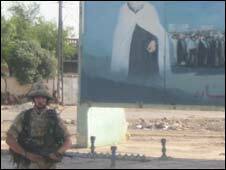 The MoD says that just nine Iraqis were detained at Camp Abu Naji and that all left the British base alive. The application is being heard by Lord Justice Scott Baker, Mr Justice Silber and Mr Justice Sweeney and is expected to last 15 days. The rest of Operation Telic 4 continued to be challenging in the extreme. British forces came under attack in Al Amara more than 300 times in three months. Sgt Wood himself was lucky to survive when his vehicle was hit by an IED, an improvised explosive device. "The thing I remember is the blast. It just sucked all your breath away," he says. "And the fire. The smoke was just unbelievable - it was full of toxic black smoke and there was no noise from the vehicle, nothing. "The gunner, Pte Samuels, was shouting, 'The boss is dead!' I looked and the boss [platoon commander] was lying at the bottom of the vehicle. "We had two injured and I was injured myself with blast to my face. The boys in the back had pierced an artery in the leg and one had shrapnel to his nose, which was dangling down," he says. "I had to patch them up and then give first aid to the platoon commander. The diesel tank in the back had split, so we were up to our shins in diesel, and there was a fire in the left hand side. "I put the fire out with the fire extinguisher, but totally forgot that you were supposed to use it and get out of the vehicle - so it took all our oxygen away. "But it did put the fire out," and he smiles sheepishly. "I must have done something right, because we were still alive." Al Amara was also where L/Cpl Johnson Beharry won his Victoria Cross for driving his comrades out of trouble under fire - twice. Sgt Wood's men, in turn, rescued him when he was hit again. "Warriors have a lot of protection, but there's no protection when it's coming through the driver's hatch and blowing up next to your face," the sergeant says. "He had a round through the helmet and next was IED'd in an ambush, and his driving got us out. Then Beharry got an RPG to the face and when we went in to pull him out of the Warrior we didn't recognise him." 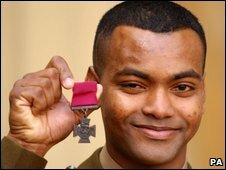 It was the last time Sgt Wood saw L/Cpl Beharry before they met again at Buckingham Palace to receive their medals almost a year later. Now Sgt Wood cannot wait to be re-united with his family. "Sometimes the dark days do come to the front of your mind, and you do think about the people that you engaged," he says, "But that's the job that you're trained to do. "And the real heroes are our families, who worry about us back at home. I'm so lucky to have an amazing wife and son, and the desire to go home and be with them now is overwhelming."